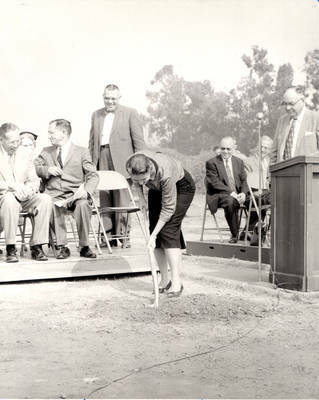 "Groundbreaking for Braden Residence Hall [West Hall]"
Groundbreaking ceremony for Braden Residence Hall [formerly West Hall], Chapman University, Orange, California. It was constructed by Chapman College in 1959 for a men's dormitory and torn down in 2007. Left to right, seated are Dr. Buell F. Enyeart, Director of Evening Division and Summer School; John Davis; standing behind is Randolph Cutlip, Dean of Graduate Studies; Colleen Richardson with shovel; Marshon De Poister [dark suit], Dean of the College; and J. E. Wilkinson at the podium. BW photograph; 9.5" x 7.5"